Wanda wants to take the Alien camping but - Oh No- it's raining! The Alien takes Wanda to his planet - he finds somewhere beautiful, he finds somewhere with wildlife and he finds somewhere just right ...but these places aren't quite what Wanda was thinking ...will they find somewhere that's perfect for both of them? Wanda wants to take the Alien camping but - Oh No- it's raining! 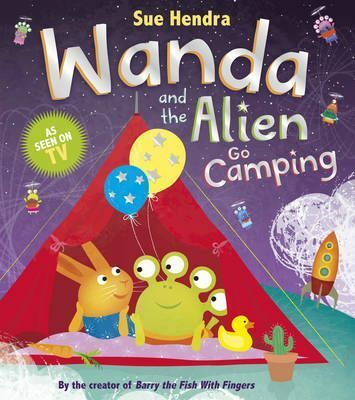 The Alien takes Wanda to his planet - he finds somewhere beautiful, he finds somewhere with wildlife and he finds somewhere just right ...but these places aren't quite what Wanda was thinking ...will they find somewhere that's perfect for both of them? Discover a new world with the fourth book in the Wanda-ful Wanda and the Alien series, coming soon to Channel 5.